We sell an extensive range of New King James Versions of the Bible (NKJV). 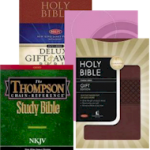 These include the popular Gift & Award edition, giant print reference, leather, chain reference, triple column and ultra-slim Bibles. See all NKJV versions here. We stock a wide range of King James (AV) Bibles, including editions with features such as large print, giant print, compact, pocket-size, reference, bonded leather, references, illustrated and Gospels/Psalms. See all AV editions here. Contact us if there’s an edition you can’t find. We can often order other editions. Bible versions are very important. If translators and editors stray from the original words and meanings, then the important message of the Bible can change too. We sell two versions of the Bible which we believe are reliable. The New King James Version (NKJV): This is a modern translation of Scripture, but aims to keep the purity and stylistic beauty of the King James Bible. It is faithful to the original Greek, Hebrew, and Aramaic texts. Many Christians find it helpful in its use of the language of today to convey Bible truths clearly. The King James Bible (AV): In 2011, many people and organisations marked the 400th anniversary of the King James Bible (Authorised Version) of the Bible. Faithful to the original manuscripts, this version is much loved by many Christians and has had a profound impact on the UK and other English-speaking countries and cultures over centuries. Need help understanding the Bible? Daily readings for Bible Beginners: Children (aged 8+), teenagers, overseas students or adults who have little or no knowledge of the Bible will benefit from Bible Treasure. You use these daily readings booklets alongside your Bible reading. Bible Treasure encourages people to read the Bible every day and to understand its wonderful message. There’s a free sample on our Bible Treasure page. Daily readings for everyone: We have Daily Readings from Spurgeon, Matthew Henry and others. See all our daily readings books. Other resources to help people to study the Bible: Study Bibles can be very useful. 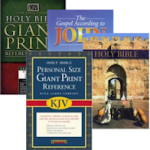 Please also find out our Bible commentaries and wide range of Bible reference books.